Seen on the Chicago streets on June 13th. Second only to the Oscar Mayer Wiener mobile in my opinion. It may not be new for all I know. It may be quite old and charted territory. However, I have resolved that this photo has not gotten the attention it merits. Whether you acuse me of being a corporate shill or not this harkens to the route 66 post modern roadside attraction era. An era that produced a whole host of enigmas from giant dinasaur attractions, to the simple little igloo taste freeze. An era in architectural thiking I'm entranced by. An era when high society and tact were blissfully non-existent. A golden age in the commercialization of culture. Mies van der Rohe eat your hart out. Via kissmobile on Flickr - Photo Sharing! 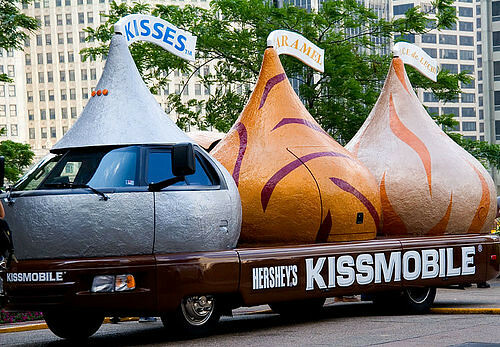 I've never seen the kiss-mobile. I found the guys who made this earlier this year while I was researching the VW Beetle design. They also made the new Corvette Stingray III. I think I'd rather drive this. That's an odd range of proojects. The could use a better website. I'd really like to see that corvet stingray III. The original was pretty cool.